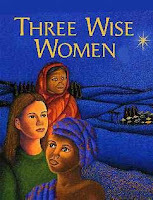 Three women from different parts of the world follow the star and give what they can. They think their gifts are not much, but what they give has symbolic value to Christ's life and teachings. The word epiphany means manifestation or showing. The take home message is that God chose outsiders to reveal that inclusivity is the hallmark of Christianity. God's love is for all-no exceptions. There were two major feasts in the early church, Easter and Epiphany. Baptisms were celebrated at both these liturgies. The time of preparation became known as Lent and Advent. The community celebrated four different comings of Jesus on the Epiphany: 1. Birth, 2. visit of Magi, 3, Baptism, 4 Miracle of Cana. The story of the Magi challenges us to recognize that God chooses outsiders, like RCWP, who are on the prophetic edge of our church to communicate the core Gospel message that God's love is for all. Each of us is a manifestation of God's love, and that love embraces all, not just the insiders or the rule-keepers. Therefore, all are welcome to receive sacraments in our communities. This is good news. We are called to be Christ to others in our daily lives. Our mission is to serve God's beloved people- no matter who they are or where they are. Alienated Catholics would be the second largest denomination in the U.S. if they were a denomination. These sisters and brothers feel the institutional church no longer meets their needs or cares about them. Roman Catholic Womenpriests communities bring good news to alienated Catholics . We offer a spiritual home where all are welcomed to receive sacraments. Noone is turned away from the Eucharistic Banquet. Inclusivity is our hallmark too! Let us go forth with great joy following the starlight! Like the wise women in the book above, we bring the gift of our lives in loving service to God's people.